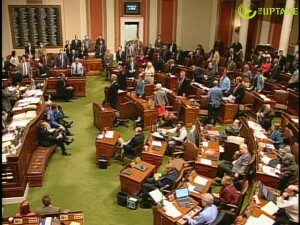 There was something strange going on in the Minnesota House chamber Thursday night. Legislators were ready to get to evening committee hearings and the House floor session was winding down when suddenly Majority Leader Matt Dean called for a recess. House Minority Leader Paul Thissen objects, pointing out that taking a recess would delay the start of many important committee hearings. Getting no explanation for the recess, Democrats call for adjournment, which fails. After the 40 minute recess Republicans try to move the controversial “right to work” also known as “rob the workers” constitutional amendment to the friendlier Rules committee than its current assignment. The maker of the motion, Representative Doug Wardlow (R-Eagan) does not appear to speak to it. After an almost three minute wait, Speaker of the House Kurt Zellers moves on to announcements and adjournment. Below: The motion from Representative Doug Wardlow (R-Eagan) that wasn’t. This evening on the House floor Rep. Doug Wardlow (R – Eagan) submitted a motion to move the right-to-work constitutional amendment legislation from the Commerce committee to the Rules committee, which would have moved the constitutional amendment closer to passage. Speaker Kurt Zellers announced that Rep. Wardlow had submitted the motion, but Rep. Wardlow was not present to speak to his motion. The House then moved on to the next order of business. “Clearly, this is evidence that Minnesota Republicans cannot get beyond their constitutional amendment agenda. Their fixation with constitutional amendments is a disservice to the people of Minnesota, and it distracts us from the bread and butter issues that actually matter to Minnesotans. Wednesday was a "doubleheader" for the Minnesota Republican gubernatorial candidates with a noon debate at Minnesota Public Radio and an evening debate at a conservative talk radio station. The UpTake was at both locations and has complete video of the debates. Tuesday's precinct caucuses brought a swift end to Rep. Paul Thissen's campaign for governor, but boosted several other candidates into the limelight.